There was a time, not too distant in this nation’s history, that to be accused of profiteering was tantamount to a treason charge. In fact, Harry Truman said as much. One gets the feeling that if he could resurrect Truman and F.D.R. for a screening of Robert Greenwald’s Iraq for Sale the reaction would be something just short of seeing Rosemary Clooney on stage in hiphuggers and a bustier. War profiteering is as time-honored as the act of killing itself; however, just like appearing in public in a Vicodin haze and a state of undress, there used to be something clandestine and scandalous about the enterprise. As this film illustrates, the act of profiteering has become essentially official state policy. Greenwald takes on the usual suspects. We begin with Blackwater’s private security team. Everyone remembers seeing the grisly scene of 13 April 2004 in Fallujah where four American citizens were burned, mutilated and strung up. The most jarring realization at the time seemed to be that these weren’t American military, but civilians. Actually, these men occupied the gray area of the mercenary. Not a state charge, exactly, but certainly not a water treatment worker or an architect. As it happens, Blackwater funds a sort of private army in Iraq. The four who lost their lives that day were doing security detail for Mr. Bremer. A reoccurring theme is set with the story of two of these men, told by grieving families. The money paid to private contractors to outsource military duties at an egregious premium is the primary motivation for said companies’ employees to be in Iraq in the first place. While we feel sympathy for the losses of the families seen throughout the film, it is hard to ignore the fact that the employees of KBR, CACI and Blackwater are there for a huge payday as well. Irrespective of this, there is a case to be made that with such hefty resources it is the duty of these companies to use some reason in deployment of hired guns and truck drivers. The beef of the families is by and large that the private contractors in Iraq cut corners to increase profits. Couldn’t call it unexpected that when an entity whose primary goal is increased profit is charged with the business of state, the invisible hand of the market chops off the occasional head. The numbers and actions of the companies profiled in Iraq for Sale make quite a case for the bereaved. Crisis communications expert Chris Lehane describes in detail what public relations moves Blackwater made after the Fallujah incident. No matter what a person thinks about the men and women seeking a small part of the fortune and the risks they take, it is difficult not to look for new and better curse words for these folks. Combine that with the 600% growth the company has enjoyed and the fact that the U.S. government awarded them with a $73 million contract from FEMA for Katrina “relief” and the question of just who is running the government becomes increasingly salient. The waters are murky here. In simplest terms, the national security state is comprised of a group of people dancing through the revolving door from the Pentagon and high public office to the private industry. Greenwald would’ve done well to address this more in-depth. The film shows many involved in what might be described as the Cheney Okie Doke, but it moves a little fast and in this case words would’ve spoken louder than pictures. Next up are TITAN and CACI. The first is responsible for four thousand linguists used mainly in interrogations. Again, the bottom line rules all. Many if not most of these linguists are marginally fluent in English. It would be hard to determine, as apparently there is no method of testing beyond an introductory phone call. Assisting TITAN with getting good intelligence is CACI. They’re the kind folks that helped bring us Abu Ghraib. As of 2004, around half of the interrogators in Iraq were private contractors. The bulk of them were provided by the company whose acronym knowingly eludes to the officer corps in the military. Why not? When a high ranking military officer wants to cash in on connections and experience, CACI is a sound choice. The second strain in the film is heard here. While low-level enlisted soldiers do the time for the disgusting acts in the prison, there seems to be no accountability whatsoever for a private company or its employees. At worst, the guilty party must return to the States and redeploy with another contractor. Or maybe work on Emergency Housing in New Orleans for TITAN, who was awarded with that FEMA contract. The most conspicuous private contractors in the Outsourced War are Halliburton and its subsidiary Kellogg, Brown & Root, or KBR. As one soldier said in his interview, “If you don’t know KBR, then you haven’t been to Iraq.” KBR runs the trucking cartel…er, business… in Iraq. Again we see the widows of drivers and those who survived the Good Friday attack on a KBR convoy (“Kill, Bag and Replace,” as one driver puts it) struggling to understand how a company’s profit motive takes precedence over human life. Again one must call into question the decision to spend that dangerous year in Mesopotamia to achieve financial security for the family. And again it comes down to these private contractors making decisions that would result in United States Armed Forces being sentenced to hang in the court of public opinion. Yes, it is a war zone. There are risks. The problem with all of the contractors in this film, and likely in Iraq, is that the bottom line trumps the human element every time. This should come as no surprise to anyone with even a general idea of economics. Halliburton has become the racial epithet of the Iraq War’s privatization. Just as minority groups choose to use common terms in order to disarm their intended venom, one hears the name Halliburton bandied about so often that he ceases paying attention. This is the only explanation for the lack of overwhelming public and governmental outrage for the actions we know about. (Just imagine the unknown unknowns.) That, and the fact that the company strategically funds Washington in order to avoid any oversight. Iraq for Sale goes down the greatest hits list: $1.4 billion in overcharges found by Pentagon audit; laundry fees of $100 a bag billed to Joe Taxpayer; niggardly running of chow halls resulting in long lines which make our soldiers sitting ducks in a sand storm; the ubiquitous $75,000 semi left for dead in the desert because of a flat tire; and, this reviewer’s personal favorite, burn pits for dispensing of the wrong equipment, ordered because of cost-plus. Cost-plus is an unusual way of doing business to most of us. Basically, the more Halliburton spends in Iraq, the more we pay them. Results aren’t really in question, just the bill. Remember the $1,000 ashtray? The $500 wrench? When the military spends lavishly, though in the case of a submarine a Craftsman won’t cut the mustard, we tend to hear about it. Often the outrage is unfounded, due to the very specific needs of military equipment. There has been some coverage of Halliburton’s misdeeds. Another classic is water treatment. They sort of forgot the chlorine in most cases. Should a Marine return from Iraq with all limbs in tact, he or she might want to get checked out for typhoid. Had this been government waste, fraud and/or abuse, I suspect we’d all be hearing about it around the clock. Well, in a way, it is. The government is, after all, who funds these nefarious captains of industry. Despite a mountain of evidence, not one piece of legislation, including amendments, for oversight has been approved by Congress. Greenwald shows one possible reason for this, albeit through the method of a quick screen graphic. Bribery. It shouldn’t shock anyone that the government is for sale. What is very surprising is how low the price tag is. For example, Halliburton has contributed $4 million and change to various governmental interests. This for a payout of billions. CEO David Lesar alone made $42,637,920 in 2004 income. Quite a return on investment. Overall, Iraq for Sale provides thought provoking arguments and rage inducing evidence. It suffers from choppy editing and the aforementioned running time. The viewer would not be unreasonable in expecting just a little more, or at least a little more time to read those on-screen graphs which follow the money. There is a comical appendix during the credits that hints upon why we haven’t heard “the other side.” This may have impacted the length of the film. Should you purchase the DVD, these shortcomings are more than made up for within the special features menu. The twenty-seven minute “Important Votes” feature could merit another review altogether. For those who don’t have the time or inclination to watch C-SPAN all hours of the day, this will give enough of a window to how this taxpayer boondoggle works. A series of amendments and brief clips of floor debates is presented. To Greenwald’s credit, there is an itemized accounting of how each Senator or Representative voted. All of them deal with one form of oversight or another, none of them passed. The most hilarious, in a laugh so you don’t cry sort of way, has to be Waxman Amendment #746, which prohibits any future contracts to any contractor who has overcharged the government by $100,000,000 or more. The language is specific, and punitive only in essentially firing the offending company. The debate reaches realms of absurdity Joseph Heller couldn’t imagine. In the feature, we see that Senator Byron Dorgan (D-ND) has been on-task throughout, presenting amendment after amendment. Senator John Warner (R-VA) appears to be just as dedicated to protecting war profiteers as Dorgan is to holding them accountable. It would be fair to suggest that the new Congressional majority should forget impeaching Bush and get to work on impeaching Halliburton, although the work could well prove more difficult. Washington might be ready. The votes are almost exclusively party-line, with a few notable exceptions. The most notable? In the “yea” column for the last two Dorgan amendments highlighted we find the lonely “R” of Lincoln Chafee. Even that couldn’t save the Rhode Island Senator from this November’s tsunami. 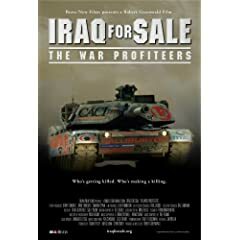 Iraq for Sale has much the public isn’t aware of, but the inspiration behind it seems more intuitive with every empty truck convoy billed to us. Review documentary films for yourself. The biggest problem with this film, and others like it, is that they are never shown on prime-time, network television. Instead, the American viewer is awash in mind-numbing entertainment like American Idol. There is a lot of solidarity in big business, especially at the network level. So true. This kind of insight will disturb anyone who still holds dear the principals and values this country’s founding fathers stood for. Who wants to face the reality that the US (government) has morphed this country into a true Evil Empire?..well back to a new season of Heros..